Bahia Santa Maria is a small horseshoe shaped bay along km 12 of the Los Cabos Corridor. This bay is popular with the snorkeling crowd as its shape creates an underwater preserve. Many color fish can be seen with just basic snorkeling gear. Because of this Bahia Santa Maria is common stop for daytime snorkeling and booze cruises and throughout the day you will see boats anchored to let their guests explore the waters. You can also access Bahia Santa Maria from the beach. Playa Santa Maria has little to no amenities, but on the weekends you will find a vendor or two offering sodas, snorkeling gear or some souvenirs. 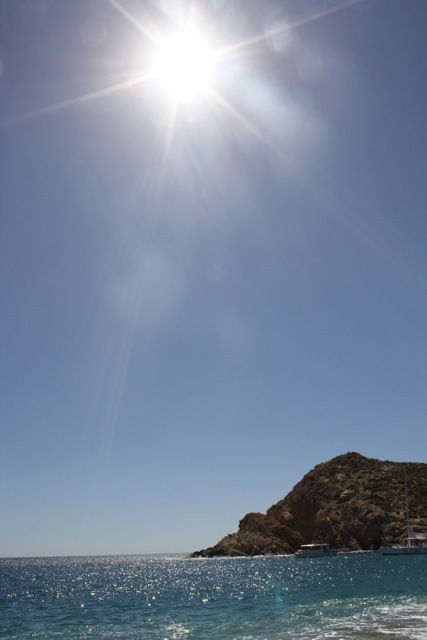 Also, the beach is barren from shade and the hot Cabo sun tends to be extra strong. If you plan on hanging out on the beach, it’s a good idea to bring a sun umbrella. On a calm sunny day, Bahia Santa Maria is a great spot to bring the whole family. Have you been to this beach? Tell us about it!